The latest recommendations show that the fight isn’t about evidence, it’s about values. Sound confusing? It’s no less so in the United States, where two leading medical bodies continue to issue conflicting mammography recommendations. The American Cancer Society (ACS) released its newest guidelines on breast cancer screening Tuesday in the Journal of the American Medical Association, calling for women to begin annual screening at 45 (the previous guidelines said 40) and then transition to biennial screening from age 55 on. The U.S. Preventive Services Task Force (USPSTF), an independent panel of experts on prevention and evidence-based medicine convened to conduct scientific evidence reviews, released its own updated draft guidelines in May, suggesting that women get screened every other year from age 50 through 74.2 Although the two recommendations are more similar than they once were, they still differ over the age at which screening should start and how often it should be done. And that means doctors and women are left to decide which advice to follow. When weighing the benefits and risks, it’s helpful to look at absolute numbers. In a clinical review published in JAMA Internal Medicine on Tuesday, Karla Kerlikowske, a physician at the University of California, San Francisco, presented some figures: A woman’s lifetime risk of dying from breast cancer is 2.7 percent without screening. Kerlikowske calculates that a woman who follows the new USPSTF guidelines could drop that risk to 2.0 percent, and one who follows the ACS guidelines may reduce the risk a few decimal places more, to between 1.8 and 1.9 percent. To get these benefits, the USPSTF program requires 13 total mammograms in a woman’s lifetime, and the ACS regimen will result in 20 breast X-rays. In exchange for these risk reductions, 61 percent of women who have annual mammograms and 42 percent of women who have biennial mammograms will be called back at least once for follow-up tests that reveal they do not have cancer, researchers write in an accompanying paper. The anxiety and stress of such a false alarm is the most common harm, but it’s not the only one. In its own analysis, the USPSTF calculated that if 1,000 women follow its advice and have a mammogram every other year from age 50 to 74, 146 of them will be subjected to unnecessary breast biopsies and 18 of the 1,000 will be diagnosed and treated for a cancer that would have never harmed them (a problem called overdiagnosis and overtreatment). Women who have mammograms more often, as they would under the ACS guidelines, will experience more of these downsides. The chart below shows the likelihood of various outcomes of biennial mammograms for women starting at age 40 and at age 50, according to the USPSTF. “False positives” are suspicious findings that do not turn out to be cancer. 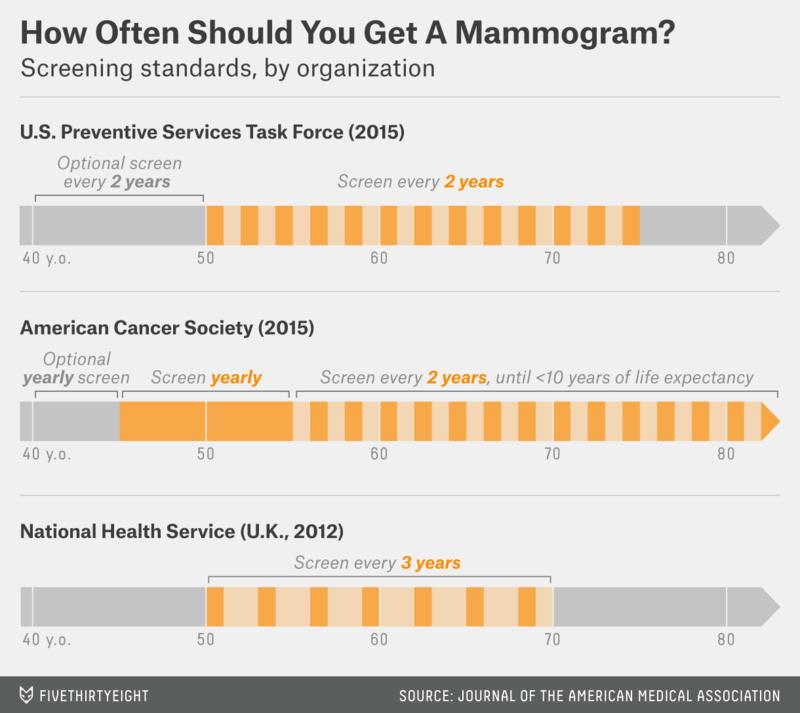 All of these guidelines claim to be “evidence-based,” yet they differ on when women should start getting mammograms and how often they should be screened. How could these expert scientific panels look at virtually the same evidence and come to different conclusions? The answer is that the evidence offers only a starting point. Studies provide statistics, but it’s up to researchers to interpret them. What a group chooses to accept as evidence will shape its conclusions, and the way the ACS and USPSTF panels considered and weighed the studies on mammography led them to disparate recommendations. The ACS, for instance, gave greater consideration to observational studies than did the USPSTF. Although observational data is notoriously subject to bias, the results from these studies consistently show that mammograms reduce breast cancer deaths, said Richard Wender, chief cancer control officer at the ACS. Mammography shows larger benefits in observational studies than it does in medicine’s gold-standard randomized controlled trials — a 20 percent to 40 percent reduction in breast cancer deaths, versus the approximately 15 percent reduction seen in most RCTs. And results from a 25-year follow-up of two landmark Canadian RCTs involving about 90,000 women — the first to track women in the era of modern therapy — found that mammography didn’t reduce breast cancer deaths at all. The USPSTF also considered observational evidence in its review, but it gave these studies less weight. The truth is, none of the studies we have is flawless, and we’re unlikely to ever have perfect evidence to answer all the questions surrounding breast cancer screening. So researchers, doctors and patients are left to do the best they can with imperfect evidence. “Ultimately, [recommendations] are judgments that are made by our panel,” said Kirsten Bibbins-Domingo, co-vice-chair of the USPSTF and a professor at the University of California, San Francisco. 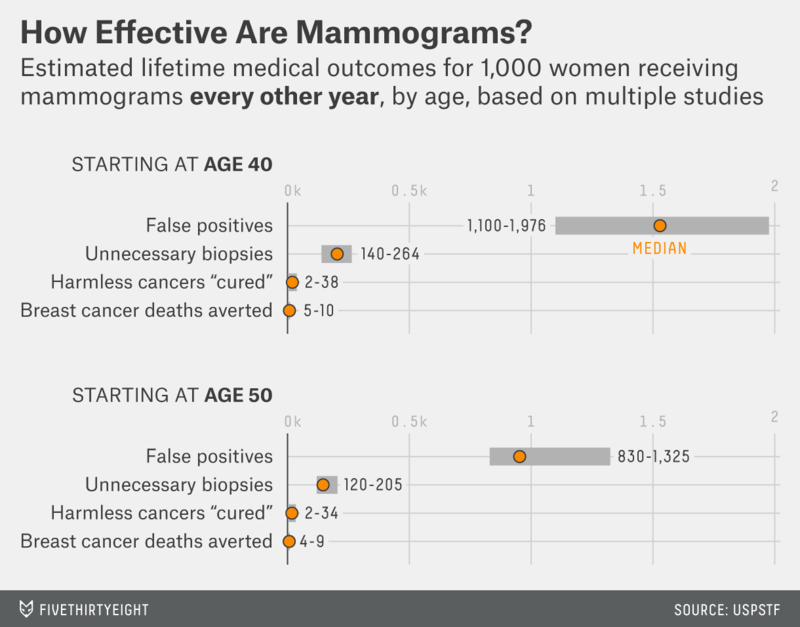 Underneath the debate about at which age and at what frequency we should urge women to get mammograms, another important question looms: Is it reasonable to recommend a test that will produce false positives for something like half of the people who take it? Is it OK to risk harming hundreds of women in hopes of helping a handful avert a breast cancer death? The ACS and USPSTF have concluded yes, but that’s a value judgment, not a scientific one. Amid all this conflicting advice, patients have to make their own decisions. After more than 15 years reporting on this issue, I’ve decided to skip mammograms altogether. My No. 1 priority is to remain a healthy person and avoid unnecessary treatments, and opting out of mammography reduces my risk of becoming a breast cancer patient by one-third. A smart friend of mine has examined the same evidence and come to the opposite conclusion, choosing to follow the ACS guidelines. She told me her priority is knowing that she’s done everything possible to avoid a breast cancer death, even if it means risking unneeded interventions and treatments. I respect her decision, even as it affirms my own: Her first mammogram produced a stressful false alarm. What we’re both seeking is assurance and certainty, and those are things that neither choice can guarantee. The NHS is conducting a trial to examine the potential risks and benefits of extending breast screening to women who are slightly younger or older than the 50 through 69 range. The task force and ACS both give women an option to begin screening starting at age 40 if they’ve decided that the benefits outweigh the risks in their individual cases. The new ACS recommendation for annual screening from age 45 through 54 is based on data from the Breast Cancer Surveillance Consortium showing that women screened biennially had a higher proportion of more advanced tumors than those screened annually, but whether that means annual screening prevents more deaths isn’t certain.